200ml white pump bottle in beautiful presentation box. Well2 Baby Bath Wash is a truly beautiful bath wash for your baby. Soft and gentle, this wash has been specifically formulated to cleanse without stripping vital oils. This is the only product you will need for bath time and it works beautifully for cleaning both skin and hair. This bath wash contains only the purest, most natural and certified organic ingredients. Clinically designed and naturopathically formulated, this bath wash is the natural choice for gentle cleansing without drying or irritating skin, and is absolutely perfect for excema prone babies. Well2 Baby Bath Wash contains Jojoba to condition and nourish the skin as well as Lavender and Chamomile oils to soothe and calm. The gentle foaming action comes from Cocoamidopropyl Betaine, a gentle surfactant extracted from coconut. Well2 Baby Bath Wash gently cleans and leaves skin and hair beautifully soft. The gorgeous scent of this product comes from the Lavender and Chamomile oils which also help to calm and soothe baby before bed. 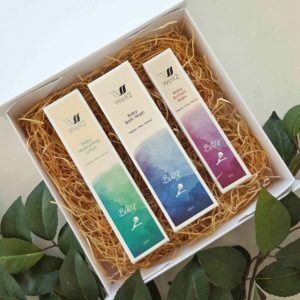 At Well2 we believe that a product should perform clinically as well as make you feel wonderful. We use only the purest and most natural ingredients because your baby deserves the very best. 50ml silver airless pump in beautiful presentation box. Well2 Baby Bottom Balm is a beautiful nappy change cream which contains only the purest and most natural of ingredients. Clinically designed and naturopathically formulated, this balm is the perfect choice for preventing nappy rash and calming angry skin. It is also perfect for eczema-prone skin. Well2 Baby bottom Balm contains Avocado and Jojoba oils to nourish and condition the skin, Cocoa butter and Candelilla to provide a natural barrier from external irritation, and skin healing and soothing ingredients including Aloe, Chamomile, Calendula and Aztec Marigold. Well2 Baby Bottom Balm is a rich creamy balm which absorbs beautifully leaving just a hint of its natural barrier ingredients. It is an incredibly effective product, and only a small amount needs to be applied each time. The gorgeous scent of this product comes from the lavender, chamomile and marigolds, and is calming and soothing. Well2 Baby Bottom Balm is packaged in a quality airless pump pack to prevent contamination from fingers which can happen with open topped jars. At Well2 we believe that a product should perform clinically as well as make you feel wonderful. We use only the purest, most natural and certified organic ingredients because your baby deserves only the very best. 100ml silver airless pump in beautiful presentation box. Well2 Baby Moisturising Lotion is a beautiful light skin conditioning cream which contains only the purest and most natural of ingredients. Clinically designed and naturopathically formulated, this moisturising lotion is the natural choice for preventing dry skin, and is absolutely perfect for excema prone babies. Well2 Baby Moisturising Lotion contains Shea Butter to nourish and heal, Jojoba, Sweet Almond and Macadamia oils to nurture and condition the skin, as well as Lavender and Chamomile oils to soothe and calm. Well2 Baby Moisturising Lotion is a beautiful, light yet incredibly effective product which absorbs beautifully. The careful choice of ingredients means that only a very small amount needs to be applied each time. The gorgeous scent of this product comes from the Lavender and Chamomile oils. Well2 Baby Moisturising Lotion is packaged in a quality airless pump pack to prevent contamination from fingers which can happen with open topped jars and standard tubes. At Well2 we believe that a product should perform clinically as well as make you feel wonderful. We use only the purest and most natural and certified organic ingredients to ensure your baby gets only the very best. This gift box contains our Baby Bottom Balm, Baby Bath Wash and Baby Moisturising Lotion and comes packaged in a quality gift box. A great choice for bubs, new mums and mums-to-be. This is a beautiful gift for all occasions – Baby showers, Baby’s arrival, baby and toddler birthdays and Christmas. Well2 Baby Bottom Balm contains Avocado and Jojoba oils to nourish and condition the skin, Cocoa butter and Candelilla to provide a natural barrier from external irritation, and skin healing and soothing ingredients including Aloe, Chamomile, Calendula and Aztec Marigold. This is a rich creamy balm which absorbs beautifully leaving just a hint of its natural barrier ingredients. It is an incredibly effective product, and only a small amount needs to be applied each time. The gorgeous scent of this product comes from the lavender, chamomile and marigolds, and is calming and soothing. Well2 Baby Bath Wash is a truly beautiful bath wash for your baby. Soft and gentle, this wash has been specifically formulated to cleanse without stripping vital oils. This is the only product you will need for bath time and it works beautifully for cleaning both skin and hair. Well2 Baby Bath Wash contains Jojoba to condition and nourish the skin as well as Lavender and Chamomile oils to soothe and calm. The gentle foaming action comes from Cocoamidopropyl Betaine, a gentle surfactant extracted from coconut. Well2 Baby Moisturising Lotion is a beautiful light skin conditioning cream which contains Shea Butter to nourish and heal, Jojoba, Sweet Almond and Macadamia oils to nurture and condition the skin, as well as Lavender and Chamomile oils to soothe and calm. 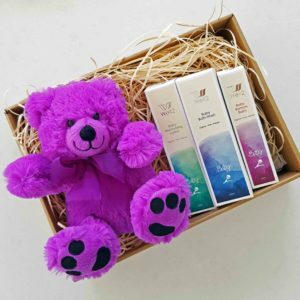 This gift box contains a beautiful plush bear, our Baby Bottom Balm, Baby Bath Wash and Baby Moisturising Lotion and comes packaged in a gift box. This gift box contains a beautiful plush bear and our Baby Bath Wash, and comes packaged in a gift box.